I bought this beer on a whim, looking desperately to try a seasonal winter ale that I hadn't had before. I had heard that Mad Elf was a Belgian Strong (one of my favorite styles), and then seeing "ale brewed with cherries and honey" on the side I became a little hesitant, not being a big fan of ales brewed with fruit and various other ingredients. I have actually had an issue lately with the overabundance of "experimental" brews that throw all kinds of ingredients together in beers to create "new and unique" flavors. I call it the "Dogfisheading" of the beer industry, being that Sam Caligione's success has really spearheaded this movement of "experimentation." Don't get me wrong, Sam is a genius, and he makes some amazing beers, but I have the mindset that you should "learn to crawl before you walk", meaning, brew some traditional brews (which Sam has done well) before you start throwing 25 different ingredients into your batches. I also believe this is true for beer "connoisseurs", that if you're going to really get into tasting different beer styles you need to try the classics first. Plus, my own beer palate enjoys tasting the different malts, hops, and yeasts used in making certain traditonal beer varieties. I simply don't want those flavors masked, or hindered by the presence of unecessary ingredients. That being said, I decided to take a gamble with this brew. I didn't even notice the ABV of the ale until I reached the counter and saw the price of the six pack ($18 and change). A little steep for a sixer, but when you're buying a six pack of 12oz bottles that are 11% ABV each, it's expected. I picked up the six pack at a local beer distributor called "Half Time" which is, hands down, the largest beer store I have ever been in. You can check them out at www.halftimebeverage.com, and if you're ever in the Poughkeepsie, NY area you will be left completely speechless and overwhelmed by their selection, like a kid in a candy shop. Appearance: Very dark mahogany in color. Clearly a belgian-style ale with it's very dark, reddish brown tint. Almost no head at all on this one, with slight lacing at the top when you swirl the glass round. It also has very low carbonation, not a vigoursly bubbly brew at all. Aroma: At first, I get a lot of candied fruit smells, very remniscent of dehydrated fruit. A lot of spice notes as well, and a brown sugar scent. Taste/Mouthfeel: On my first sip I there is a clear presence of candied fruit/brown sugar tastes, and also molasses notes. This sweet taste dissipates to a slight bitterness on the back end, with a little nip of alcohol at the very end. During my addtional sips I get a lot more of the molasses notes, coupled with more of the candied fruit notes. The lack of carbonation makes this suprisingly drinkable (and dangerous). In additional sips the sweetness of the honey becomes more prevalent, quelling the nip of the alcohol on the back end. This is definitely a full bodied beer, with very deep, rich, and complex flavor profiles. It almost evolves with each sip, and you can discover new tastes each time you put it to your mouth. Overall: 9 out of 10. Every so often a seasonal beer comes along whose aromas, taste and overall feel force you into the mindset of that season. This beer has done exactly that. After finishing the beer I felt as though I had thrown a warm, wool sweater on (probably the high ABV of the brew). 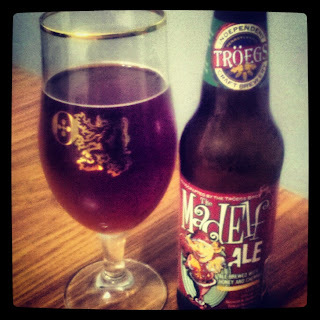 With the full body of the Belgian Strong, Troegs did an excellent job of conveying the feeling associated with the season. Feelings of warmth, spice, sweetness, and joy. Mad Elf is a beer that is a fitting holiday brew, a real "warmer" that throws you into memories of sitting around a burning yule log listening to family members regale you with stories of holidays past. Pick this one up, and enjoy with some friends and family this holiday season.